A double layer of hooks--one for coats and one for accessories--provides storage for outerwear without taking up valuable floor space. Metallic plate with silver epoxy finish. Each hook has two wooden pegs that prevent damage to garments. 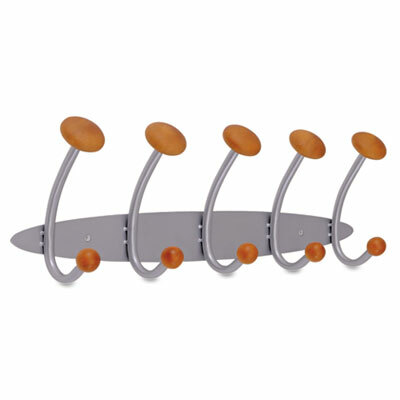 A stylish accent, this space-saving wall rack gives customers a place to hang their jackets. A double layer of hooks--one for coats and one for accessories--provides storage for outerwear without taking up valuable floor space. Made from durable metallic plate with an attractive silver epoxy finish. Each hook has two wooden pegs prevent damage to garments.